This is ongoing work for the homemaker installation, currently titled ‘Mrs. 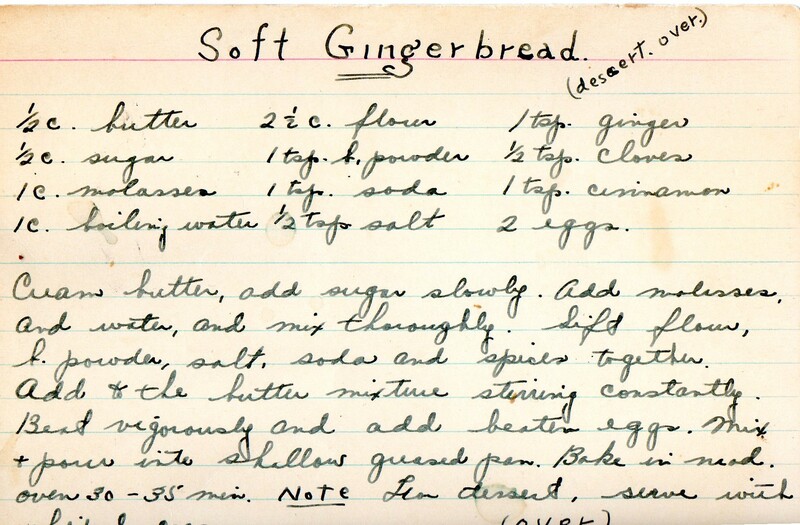 Williams, Homage to a Homemaker, In Praise of Women’s Work. 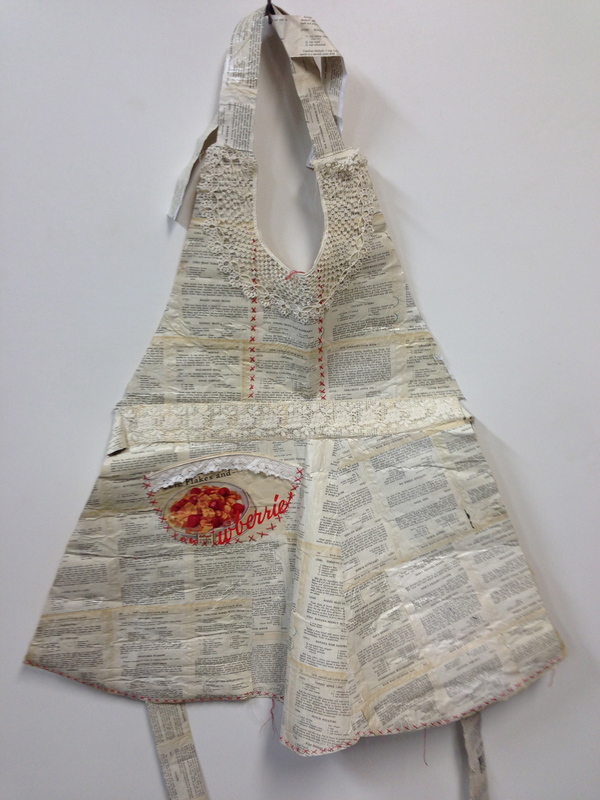 This apron is made from cook book pages stitched together and sewn into an apron. 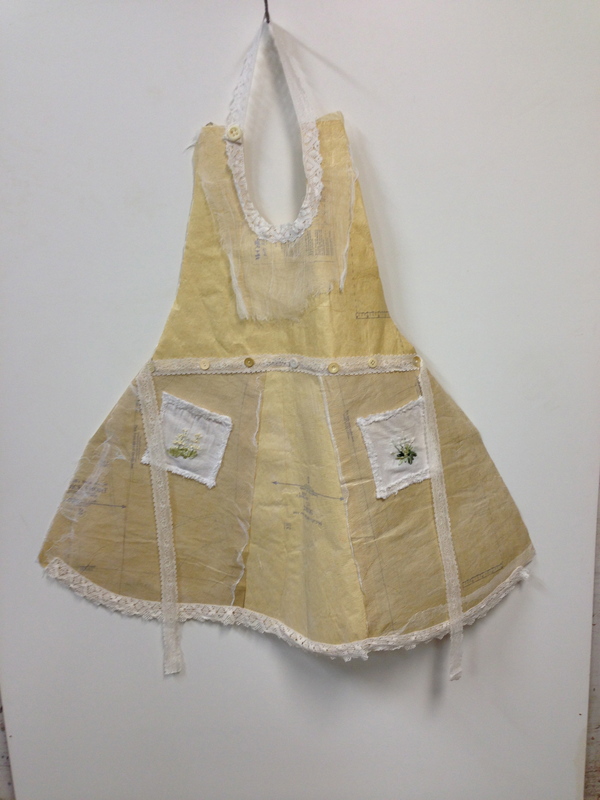 Judith, my collaborator, made this apron. I loved her addition of lace, embroidery, and the cereal photo pocket. 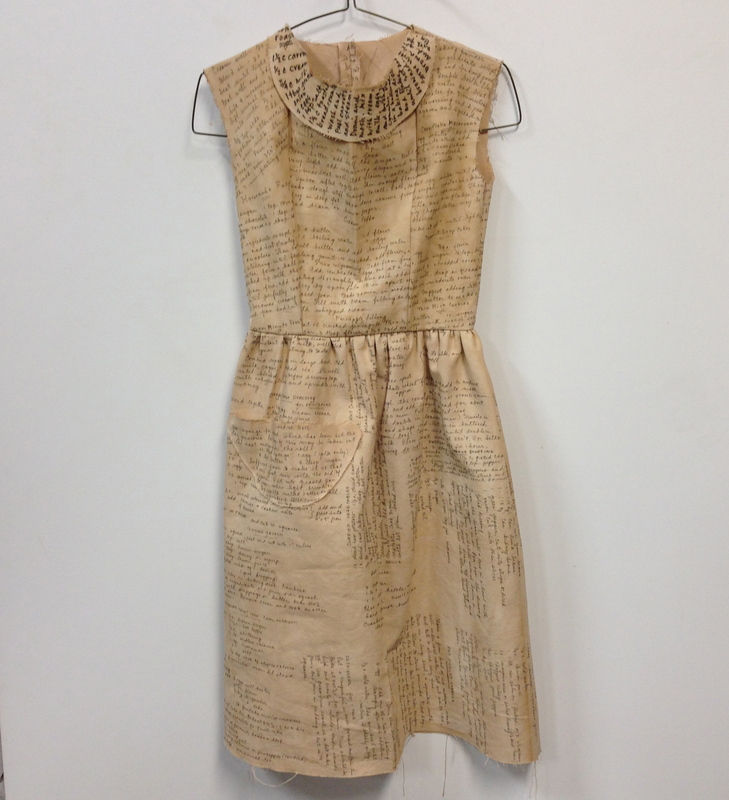 I tea stained the canvas and then wrote recipes all over it and Judith cut and sewed the dress. 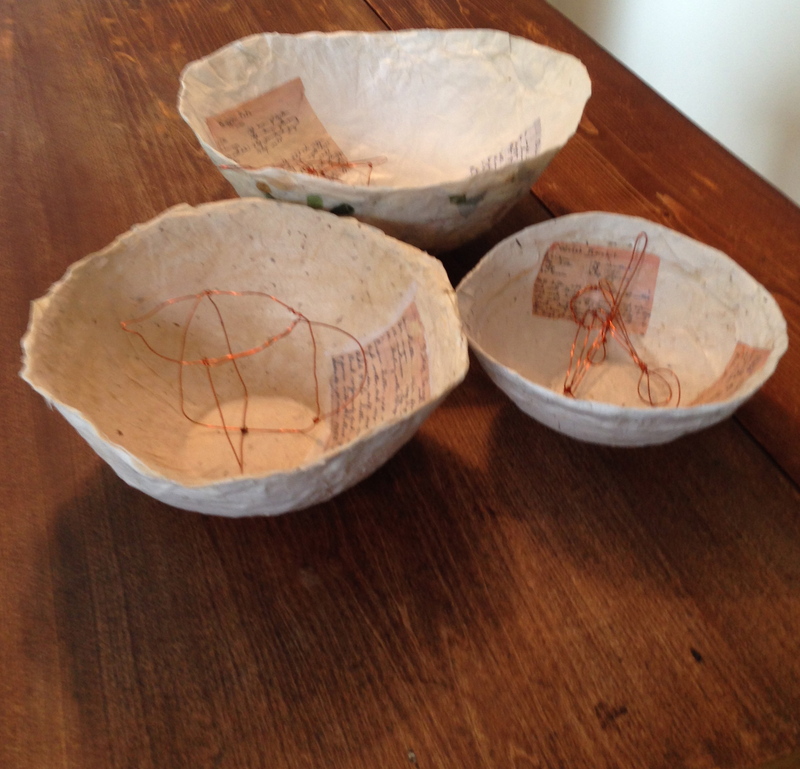 This mixing bowl set was made of layers of handmade paper and collaged with recipes. I made some wire utensils and a measuring cup to go in each bowl. Another apron in the series. For this one we glued pattern paper onto a paper backing and covered the whole with tea stained cheese cloth. Once again Judith stitched it up and added lace, buttons, and embroidered pockets. This is my favourite. We cut black plastic garden netting, which I have had for years, into the house dress pattern and Judith, bless her heart, had the joy of stitching it together. She added a lovely red fringe given to her by Mrs. Williams. It doesn’t look so much like the 50s house dresses but I love the look. We have many more pieces not photographed yet and are still working on the project. We have memory boxes to make, another apron and a house dress, from some fabulous Ikea material, mason jars to fill and books to make. 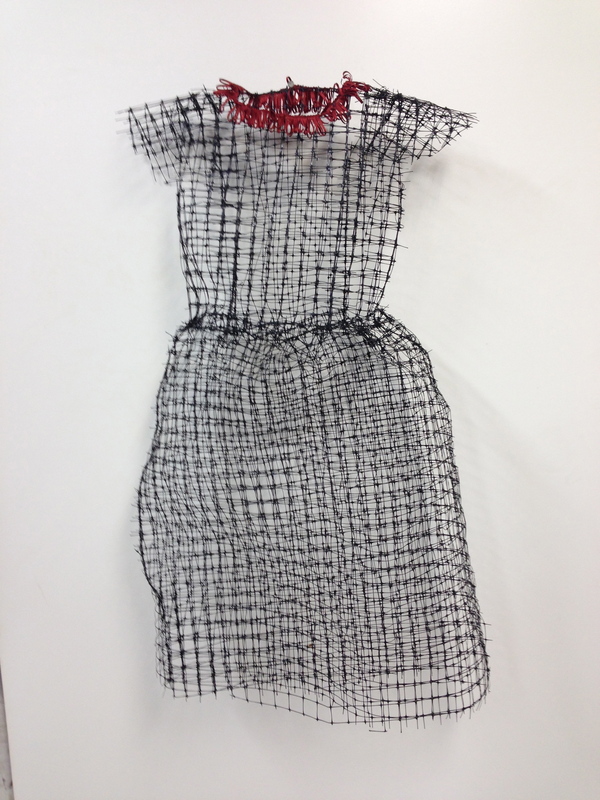 This entry was posted in Uncategorized and tagged collage, dyeing, installation, Mrs. Williams, sewing. Bookmark the permalink. These are so creative and charming, both hilarious and tender. Brilliant work. Can’t wait for more! I really love this work. You make a great creative team.